Utilizing native plants and restoring native plant habitat is vital to preserving biodiversity. By creating a native plant garden, each patch of habitat becomes part of a collective effort to nurture and sustain the living landscape for birds and other animals. Native plants can be used around homes and in gardens to create sustainable landscapes. Most native plants are perennial and have extensive root systems that hold soil and slow runoff. Persistent stems, leaves, and flower parts which remain through the winter also reduce runoff, especially in the spring, as snow melts and rainfall begins before new growth is present. Particulate matter accumulates around these native plants and the plants themselves absorb chemicals such as nitrogen and phosphorous that would otherwise enter the runoff. Native plants have many positive characteristics. Native plants used as buffer strips along water margins slow runoff and absorb nutrients. They are also self-sustaining, and they support wildlife including beneficial insects, pollinators, and native birds. There’s no getting around it: Using native plants makes your landscaping plans more complicated. Instead of just driving to the nearest garden center and picking out plants that look nice, you have to do some research to find plants that are native to your area and fit into your goals for your garden. But the extra effort you put into planning your garden now will pay you back in the time you save on yard work every year from now on. An in-depth explanation of native tree selection criteria is available to the right. Specific plant information available on link below image. The Allegheny Blackberry is a multi-stemmed shrub, measuring 6 to 12 feet wide, and around 3 to 6 feet tall. The bark takes on a purlish-red color and is well armed with small thorns called prickles. The leaves are dark green in summer months, but come fall season, they can turn orange, purple and red. The blackberries themselves are raspberry-like and cluster similarly. During the middle of spring is when one can find the greatest bloom, then as summer arrives, the plant begins producing fruit and seeds. Commonly forms broad colonies. Erect branches become arching. Bark is purplish-red and armed with prickles. Dark green summer foliage is palmately or pinnately compound, becoming orange, red and purple in fall. Loose, terminal clusters of five-petaled flowers are followed by thimble-shaped, raspberry-like, blackberries. The fruits of Common Blackberry tend to be a bit larger and more elongated than those of other blackberries, and they usually have an excellent flavor. This blackberry is distinguished from other blackberries by the numerous glandular hairs on the peduncles and pedicels of its elongated racemes of flowers. Furthermore, its mature leaflets are usually no more than twice as long as they are wide. 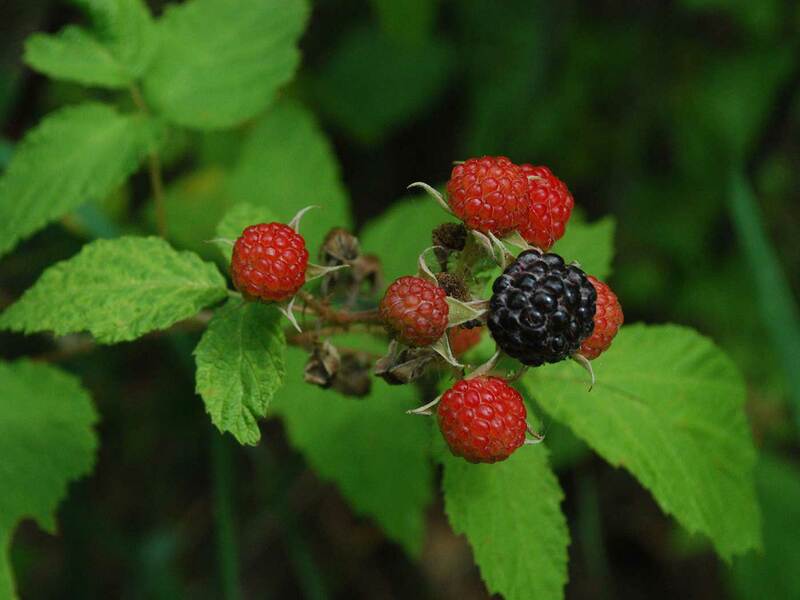 These two characteristics distinguish the Common Blackberry from other Rubus spp. The fruit is the star of this plant and like most wild berries can be used in a variety of recipes. Enjoy the fruit fresh off the bush (after a good washing of course), cooked in a pie or cobbler, or even dried for mixing in with your favorite trail mix. Viburnum dentatum, commonly called arrowwood viburnum, is an upright, rounded, multi-stemmed, deciduous shrub which typically matures to 6-10′ tall with a similar spread, but may reach a height of 15′ in optimum growing conditions. Non-fragrant white flowers in flat-topped corymbs (to 4″ diameter) appear in late spring. Flowers give way to blue-black, berry-like drupes which are quite attractive to birds and wildlife. Ovate, toothed, glossy dark green leaves (to 4″ long). Variable fall color ranges from drab yellow to attractive shades of orange and red. Although widespread in eastern North America, this native plant is only known to exist in the wild in Missouri on wooded slopes along the Salt River in Shelby County. Easily grown in average, medium moisture, well-drained soils in full sun to part shade. Prefers moist loams, but tolerates a wide range of soils. Established plants have some drought tolerance. 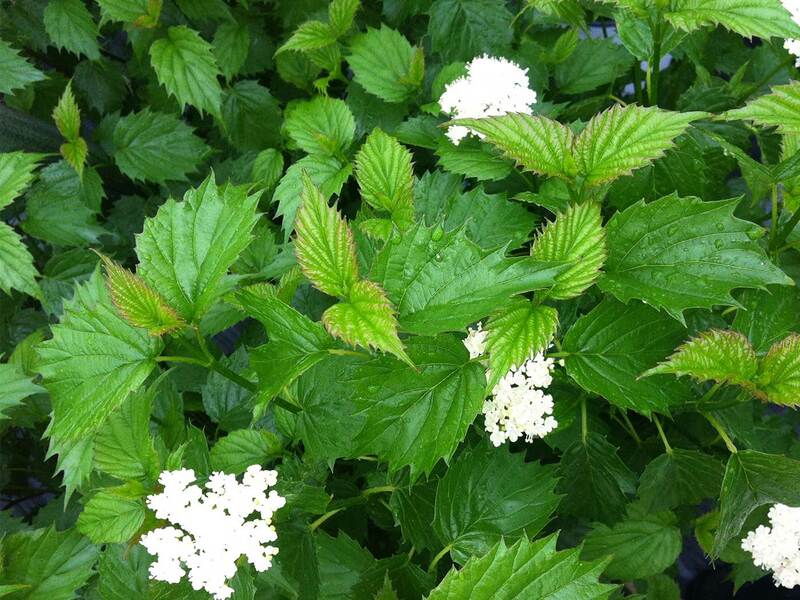 Prune as needed immediately after flowering.Arrowwood viburnum provides two seasons of interest: spring and fall. In spring, the dark green, dense, toothed foliage provides a backdrop to the 2-4″ flat-topped clusters of small white flowers from May through early June. One cultivar, Red Feather®, provides spring interest with new foliage that emerges red-purple before turning green. Autumn is the main season of interest for this species because of the colorful combination of blue to bluish black berries and fall foliage in tones of yellow, red, and purple. 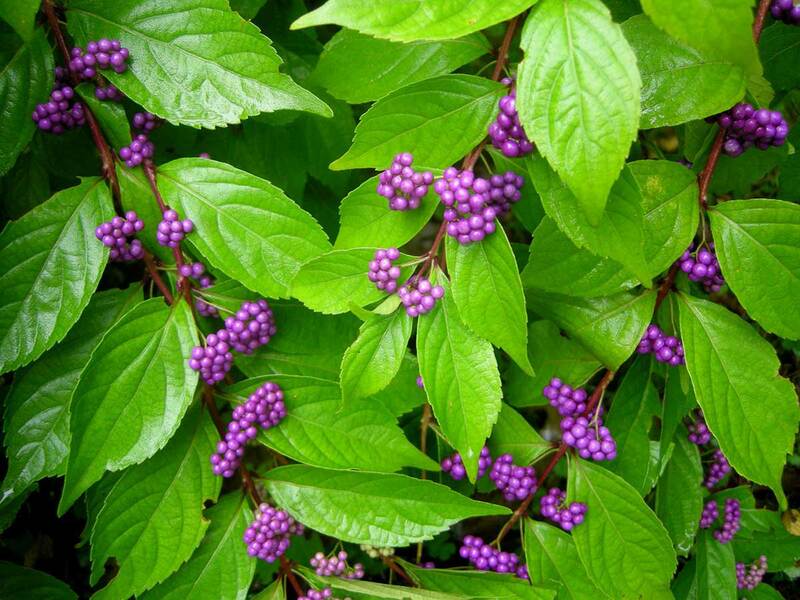 Callicarpa americana, commonly called beautyberry, is a loose open shrub valued for its spectacular fruits. The relatively insignificant flowers develop into prolific bright violet to magenta berry-like drupes which encircle the stem. These fruits remain attractive for a long time although they are generally gone before severe winter weather. Genus name comes from Greek meaning beautiful fruit. This native plant prefers the soil of its natural forest floor habitat – a moist clay or sand enriched with organic matter. 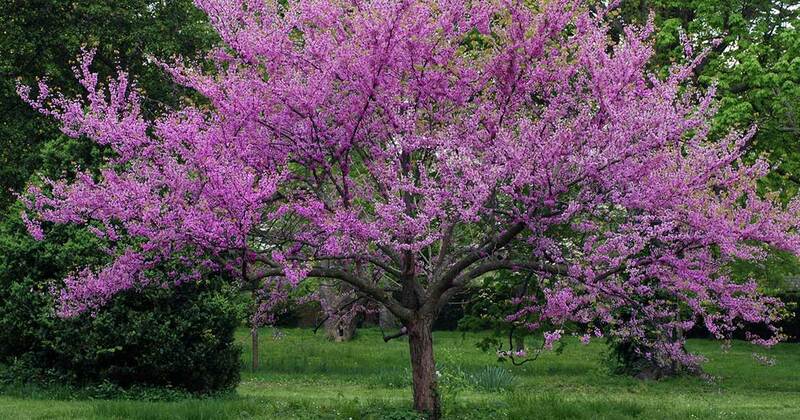 It will fruit most abundantly in full sun but may be grown in light shade. The plant needs minimal care once its roots are established. Since Missouri is at the northern edge of beautyberry’s range, the foliage will be killed back to the ground in most winters. This will not affect the flowering as the plant blooms on new growth. In warmer areas, this shrub may be pruned back to about 2′ less than the desired size. Propagate by cuttings or from seed.